My art is not just about my ideas and concepts, it is also about the abilities and experiences of the people who interact with my work. For me, a work of art is completed when people engage with it. I base my work upon this belief. What drives me is that by changing the experience of art engagement by encouraging a more complete sensory experience we can learn more about ourselves and how we fit into the world. Tactile/visual art also expands our understand of how others with sensory differences effectively approach the world using alternative methods. It’s fun to discover new ways to see! I am dedicated to making information about the world more accessible for people who are blind or visually impaired. If we can make access to information available, I feel, it is our responsibility to do just that and it can be intriguing visual artwork at the same time. My work has been evolving through the years. Twenty years ago, when I first made the decision to make my work tactually accessible I sacrificed the visual in favor of the tactile when I came up against a design conflict that I couldn’t resolve. Gradually I found that by making my visual art more poetic, by streamlining and eliminating visual clutter, I was no longer running into visual/tactile design conflicts. As I progress into my next stage of work it will include sound. I have recently been working with some computer scientists and I can see that an audio element is going to become an important part of my design in the future. I am happy to be on this exciting journey and am looking forward to see where this road takes me. I would like to welcome you all along for the ride. 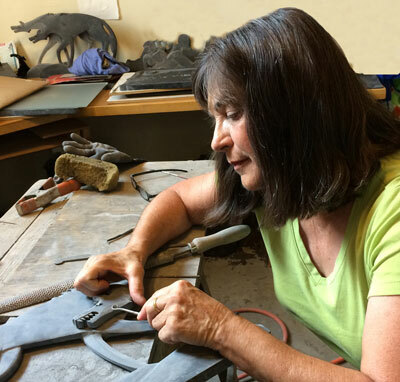 Ann started sculpting stone when she was 15 years old but it wasn’t until 1992 that she wondered if the low relief slate pictures she was making could be understood by someone who was blind. Answering that question has guided her for many years. She learned through creating and exhibiting artwork nationally, and teaching art at the Colorado Center for the Blind that the answer is an unqualified "Yes!" As a certified botanical illustrator it is extremely important to Ann that the images she creates are clear and accurate. Ann contributed illustrations to Rocky Mountain Flora by Dr. Wm. A. Weber, a standard in the Rocky Mountain region, and has also taught botanical illustration classes at the Denver Botanic Gardens. In recognition of her life long contributions to the field, Ann was honored to receive the Sydney Parkinson Award from the Botanical Arts and Illustration Program at the Gardens. She continues to work with students who are blind by opening the doors of the Gardens to them and making information about the plants accessible. Ann Cunningham has created numerous large scale artworks for public and private collections in the United States and Canada including: The Colorado Springs Fine Arts Center, Colorado Springs; The National Federation of the Blind, Baltimore; Iowa Department for the Blind, Des Moines; and Pleasure Point Park, Santa Cruz, California. You can find out more information about these and other works of art on the Tactile Artwork link in the menu above.